On October 22, 1999 Apple launched Mac OS 9, its major new release of the Macintosh operating system. 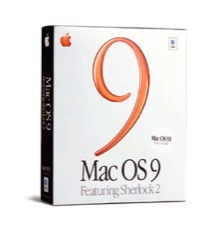 The last boxed edition of the “classic” Mac OS line carried a retail price of 99 USD (with a 20USD rebate for customers who owned Mac OS 8.5 or 8.6) and featured new Internet tools such as Sherlock 2, which was lauded by CEO Steve Jobs in the press release. The updated version of Apple’s search tool was explicitly modified with a plugin system so that the new Sherlock could access search engines, websites, services and even follow auctions, helping the users with information retrieval but also shopping and online commerce. To launch the operating system Apple Authorized Resellers (among which were chains such as CompUsa, Sears and Fry’s) held throughout the following weekend special Mac OS 9 “Midnight Madness” events, Apple Demo Days and in-store promotions.